Do these type of rotors have an advantage over regular rotors?? Unless you\'re running pads from the \'60s, they don\'t do you any good at all, especially on the track where they are more likely to crack from the holes. \r\nPorsche uses them for endurance racing where there is a good likelihood of standing water from rain, giving the water someplace to go. But they still crack often in dry conditions. \r\nDrilling these days is mostly for "sporty looks." \r\n"Crossdrilling your rotors might look neat, but what is it really doing for you? Well, unless your car is using brake pads from the 40’s and 50’s, not a whole lot. Rotors were first ‘drilled’ because early brake pad materials gave off gasses when heated to racing temperatures – a process known as ‘gassing out’. These gasses then formed a thin layer between the brake pad face and the rotor, acting as a lubricant and effectively lowering the coefficient of friction. The holes were implemented to give the gasses ‘somewhere to go’. It was an effective solution, but today’s friction materials do not exhibit the same gassing out phenomenon as the early pads. \r\nFor this reason, the holes have carried over more as a design feature than a performance feature. 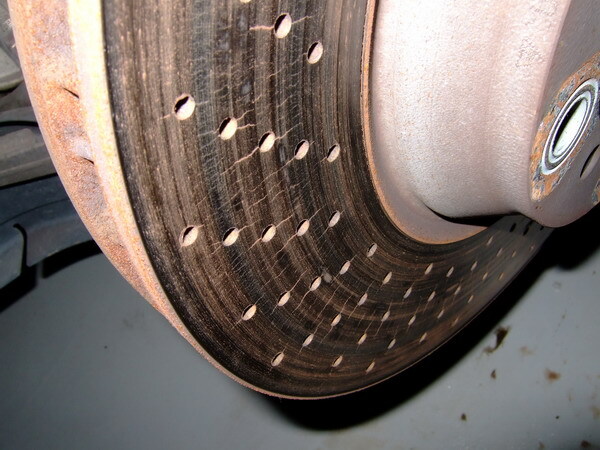 Contrary to popular belief they don’t lower temperatures (in fact, by removing weight from the rotor, the temperatures can actually increase a little), they create stress risers allowing the rotor to crack sooner, and make a mess of brake pads – sort of like a cheese grater rubbing against them at every stop. (Want more evidence? Look at NASCAR or F1. You would think that if drilling holes in the rotor was the hot ticket, these teams would be doing it.)" \r\nFor many years most racing rotors were drilled. There were two reasons - the holes gave the "fireband" boundary layer of gasses and particulate matter someplace to go and the edges of the holes gave the pad a better "bite". \r\nUnfortunately the drilled holes also reduced the thermal capacity of the discs and served as very effective "stress raisers" significantly decreasing disc life. Improvements in friction materials have pretty much made the drilled rotor a thing of the past in racing. Most racing rotors currently feature a series of tangential slots or channels that serve the same purpose without the attendant disadvantages." \r\n"Cross drilling a rotor weakens the integrity of the rotor, while providing for very little, if any performance benefits. In extended high temp braking situations (track use), with track pads and track rubber, cross drilled rotors can present a serious danger due to thermal fatigue, eventually cracking and undergoing catastrophic failures. This happens with all manner of cross-drilled rotors, whether they are drilled, "cast", cryotreated, or even multi-thousand dollar special Porsche/Ferrari brakes." wow I learned something there.haha thanks for the lesson. know I have to cancel my order for drilled rotors and just stick with standard rotors.hey I have a ? what would be the perfect set of pads for autox. \r\nHawk HPS for that, but I hear they arent very good for DD, Hawk HP are better for that. Hawk HPS for that, but I hear they arent very good for DD, Hawk HP are better for that. \r\nOhh wow I forgot all about Hawk Performance. I guess I\'ll try the Hawk HPS. They\'re not pricey at all.